On Monday the 8th of August Ms Duff’s English Language excursion visited well known linguist and head of speech pathology Libby Clark at Charles Sturt University in Albury. The students were lucky enough to be given a one and a half hour discussion group session in the library on topics including “How children acquire language”, “Written versus oral communication” and other related linguistic issues. Prof Clark was very impressed with the students level of knowledge, questions and humour. The students were most impressed with Clark’s passion, communication skills and ability to cover such a wide range of topics in a hugely engaging manner. 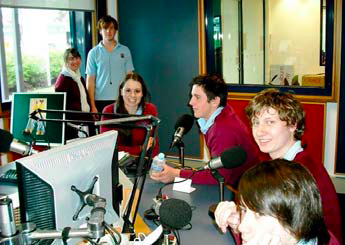 The students were then taken to visit ABC Golburn Murray Radio where they meet with presenter Joseph Thomsen to discuss the differences between spontaneous speech and presenting on the radio. The students were also given the opportunity to practice what they are studying by recording an interview whilst they were there which they will analyse in class later on. The day out served to further the class interest in English Language and allowed us to get a glimpse of some further applications of this wonderful subject both in tertiary studies and in the workplace.